A tec, Inc. has been designing and manufacturing instruments for energy exploration for over 50 years. We have established a solid reputation for rugged, quality products and superior customer support. Our corporate energy ancestry includes CATCO, SIP, Lymco Electronics, Kestran, Amtex Supply, Coastline Exploration, Coltex Drilling and Atec Resources. Now, we have oil patch stalwarts, Celtech in the Permian, Hager Machine & Tool in north Houston and Vital Link in far west Houston in our family. Atec’s energy support history includes downhole and surface equipment. We have manufactured both the Measurement While Drilling (MWD) and Measurement While Perforating (MWP) tools, both for the down-hole and surface systems, and are currently supporting surface equipment for perforating, completion and exploration. As an added capability after manufacture, complete acceptance testing allows the product to be shipped directly to the field user. Hager Machine & Tool and Celtech offer more mechanical tools and support equipment for the oil patch, and Vital Link can fabricate just about anything. Our expertise in high temperature electronics and soldering, as well as other critical operating conditions requirements, are well known. Whether it’s flight, spaceflight, or downhole, Atec is unsurpassed in providing equipment for fail-safe environments. Atec has a solid history of taking a customer’s prototype design from paper to product. We assign an experienced engineering and manufacturing team to work with the customer and help them refine their design for economical manufacture while maintaining the technical capabilities of the product. When it comes to new or legacy products, Atec listens to the customer’s needs first, then designs and manufactures solutions to increase field reliability and decrease product support costs for the customer. Atec has expanded our offerings at our Celtech plant, located in Carlsbad NM, to include machining, fabrication, electrical assembly and, most recently, high durability coating/painting for oil patch and industrial customers. Hager Machine & Tool’s shop in north Houston provides CNC turning and 40 years of low cost machining for oil patch customers. 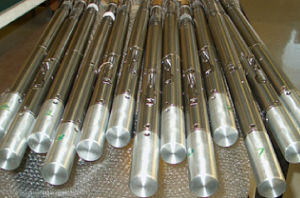 Hager makes hundreds of machined downhole testing and drilling items. Now 5 axis and waterjet machines broaden Hager’s capabilities. Celtech located in Carlsbad, NM is in the busy Permian Basin. Vital Link near Sealy, TX offers very large fabrication at its 30-acre I-10 plant.